A genus of about 10 species, natives of the Old World. Type species: Eulalia japonica Trin. 328, in part. 1794. Erianthus japonicus Beauv. ; R. & S. Syst. 2: 324. 1817. Ripidium japonicum Trin. Fund. Agrost. 169. 1820. 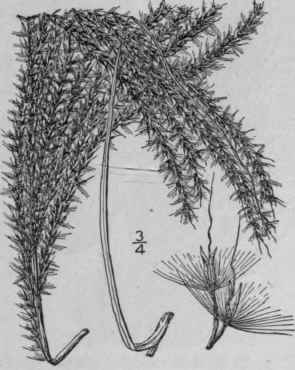 Eulalia japonica Trin. Mem. Acad. St. Petersb. VI. 2: 333. 1832. Miscanthus sinensis Anderss. Oefv. Sv. Vet.-Akad. Stems 3°-6° tall; leaf-blades up to 30 long and 8" wide; panicle 8'-16' long, its branches erect or ascending; spikelets 2 1/4"-2 1/2" long, yellowish brown, shining, glabrous, encircled at the base with white or purplish hairs equaling or exceeding them, the awn 4"-5" long, spirally twisted at the base. Escaped from cultivation at Washington, D. C, and on Long Island; also in Florida. A native of China, Japan and the Celebes.